Hand hygiene is one of the most important steps that can be taken to avoid getting sick and spreading germs to others. Especially in a healthcare setting, it is the first line of defense when interacting with patients. Vanderbilt University Medical Center (VUMC) physicians, nurses and IT specialists understand this all too well, having recently collaborated on an iOS app that more efficiently documents and reports hand-hygiene compliance. 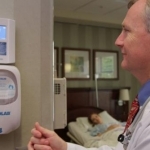 Recently, Proventix Systems, a company that provides the tools and services for quality compliance monitoring, active point-of-care communication, and successful behavior modification, announced that their nGage system has become the most widely adopted healthcare hand hygiene monitoring system in America. The nGage system has reported that people have sanitized their hands over 4 million times, eliminating countless germs.